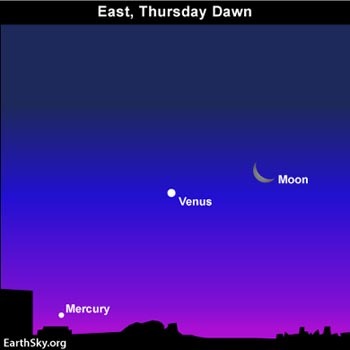 If you look in the eastern predawn sky in the coming mornings, you will find the moon and planet Venus close together. They will be a beautiful sight tomorrow morning, shining nearly side by side. Venus is easy. 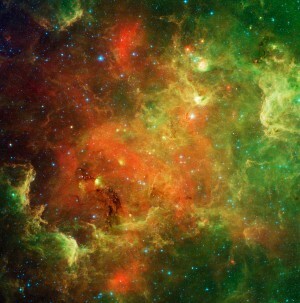 It is the brightest object there other than the sun and moon. However, Mercury –the most elusive planet – is also up before dawn, closer to the horizon. Now here is a challenge. Did you see Mercury in evening dusk in early December? If so, December 2010 provides you with the unique opportunity to catch Mercury in both the evening and morning sky in a single month. Look for Mercury an hour before sunrise tomorrow or the next day. Binoculars will help! I have never seen Mercury in both the evening and morning in one month. But I’m certainly going to try it this December. To see Mercury in the east before dawn, you need to find a level and unobstructed horizon in the direction of sunrise. The blazing planet Venus will be the first object you will spot, shining brightly before the dawn. Try looking for Mercury below Venus, close to the east-southeast horizon from about 1.5 hours to one hour before sunup. As seen from mid-northern latitudes – Mercury appears to the lower left of Venus. Binoculars help immensely during any Mercury search. Although this planet shines as brightly as one of the sky’s brightest stars, Mercury sits low in the sky and is easily obscured in the murk of morning twilight. At such times, binoculars might let you spot Mercury when you otherwise could not see it through the early morning haze. Mercury will be easier to spot in early January 2011 because it will rise sooner before the sun and will brighten in magnitude. However, if you’re up for the challenge, try catching Mercury in both the evening and morning sky in December 2010!